Only one thing is better than harvesting your own fresh vegetables from the garden, and that is finding that you can go on enjoying your produce long after the crops are in. All you need is a little skill - or the willingness to learn - and you can turn some of your most abundant produce into delicious preserves. 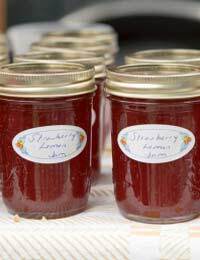 Home-made jams, jellies and other preserves are second to none and making them successfully is surprisingly simple. The golden rule is to sterilise your jars before you fill them and then seal them properly. It is important that they are then left until the contents have cooled before attaching a label, stating clearly what is in each jar, and the date the preserve was made. There are various possible methods to sterilise jars and lids. The easiest is a dishwasher. Put jars and lids in the machine and run it on the hottest setting. Alternatively, put jars and lids in a large pan and cover with hot water. Bring to the boil and boil for ten minutes before pouring off the water and turning jars and lids upside down to drain. There are different methods of sealing for different preserves. After potting, sweet jams and jellies can be covered with a wax paper disc, then the neck of the jar sealed with cellophane, held in position with an elastic band or sealed with a screw-top lid. Acidic chutneys and relishes need non-metallic lids, because the vinegar content corrodes metal. Bottled fruits and pickled vegetables can be sealed in clamp-top jars with rubber seals. Wax discs, cellophane seals, rubber bands and labels are all readily available in inexpensive packets in hardware stores and cookware shops. Empty glass jars and screw-top lids are also available - although you may get into the habit of keeping jars back from the recycling bin to build up a ready supply. If you decide to bottle fruit or pickle vegetables it is worth investing in wide-necked clamp-top jars, with rubber seals, which will last for many years with care. Another good investment is a jam thermometer. The basic method for making clear jellies is to boil the fruit with water and then strain off the juice through a jelly bag, or muslin. The juice is heated gently with sugar (usually 450g of sugar to every 600 ml of juice), stirring until the sugar dissolves. Then, bring to the boil and boil rapidly to a temperature of 105 degrees C (220 degrees F).Remove from the heat, skim off any scum, pour into sterilised jars and seal, cool and label. Soft summer fruits such as berries make particularly good jams. You may need to add a little water or fruit juice to less juicy fruits such as peaches and apricots. This method for raspberry jam can be used as a basic technique for other fruits. Put 450g of raspberries and 1 tsp of lemon juice in a large pan and place over a low heat until the juices begin to run (low pectin fruits like strawberries will need an extra teaspoon of lemon juice). Allow to simmer gently for about ten minutes. Crush the fruit with the back of a wooden spoon and add 450g of sugar. Stir over a low heat until the sugar has dissolved. Bring to the boil and boil rapidly, stirring occasionally, until the temperature reaches 105 degrees C (220 degrees F). Remove from the heat and skim off any scum. Pour into sterilised jars and seal. Cool completely, label and date and store in a cool, dark place. Preserving fruits in alcohol is a simple and delicious way to enjoy them out of season. Put a mixture of 900g of fruits - such as strawberries, cherries, blueberries, raspberries and blackcurrants - hulled and with stalks removed, into a large bowl. Sprinkle with 225g of caster sugar. Cover the bowl and leave it to stand for one hour. Spoon fruit and any juices into a sterilised preserving jar and pour about 1 litre of rum over to cover. Put clear film over the jar top. Seal and store in a cool dark place for about two months before serving. Preserved with salt and vinegar, these products should be kept for at least two weeks before serving and once opened should be stored in the fridge. As a guide to basic technique, put 500ml red wine vinegar in a large pan with 280g light brown sugar, 150g sultanas, 1 tsp ground cinnamon, 1 tsp ground allspice and heat gently, stirring until the sugar dissolves. Bring to the boil. Add 450 grams of peeled, pitted, chopped fruit such as peaches, 3 sliced onions, 2 green chopped chillies, 3 crushed garlic cloves, 2 tsps grated root ginger and 1 tsp salt. Return to the boil, reduce heat and simmer, stirring frequently, for 45 minutes until chutney is thick. Spoon into warmed, sterilised jars, seal and label.